1 | Local small businesses are linked to higher incomes and less inequality. 2 | Entrepreneurship fuels job creation. Across the country, the rate of new business formation has fallen sharply over the last 20 years, contributing to sluggish job growth and wage stagnation. “New businesses account for nearly all net new job creation,” concludes a Kauffman Foundation research brief. 3 | Independent businesses generate more tax revenue at lower public cost. 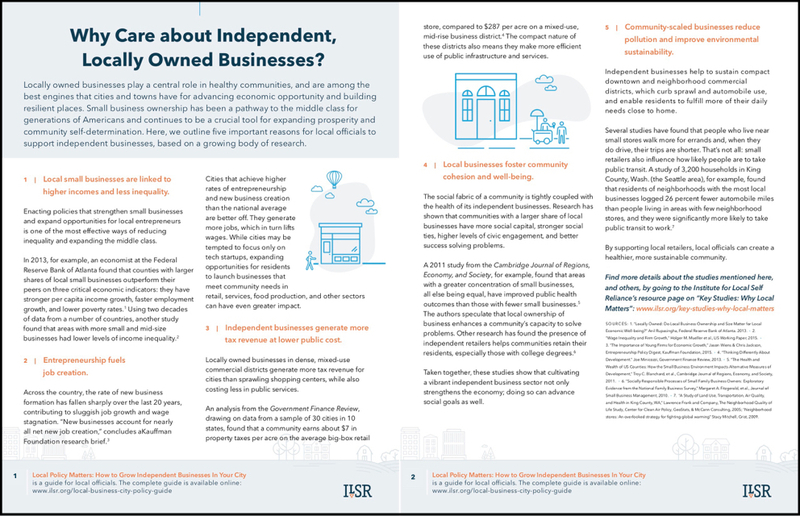 Locally owned businesses in dense, mixed-use commercial districts generate more tax revenue for cities than sprawling shopping centers, while also costing less in public services. An analysis from the Government Finance Review, drawing on data from a sample of 30 cities in 10 states, found that a community earns about $7 in property taxes per acre on the average big-box retail store, compared to $287 per acre on a mixed-use, mid-rise business district. The compact nature of these districts also means they make more efficient use of public infrastructure and services. 4 | Local businesses foster community cohesion and well-being. A 2011 study from the Cambridge Journal of Regions, Economy, and Society, for example, found that areas with a greater concentration of small businesses, all else being equal, have improved public health outcomes than those with fewer small businesses. The authors speculate that local ownership of business enhances a community’s capacity to solve problems. Other research has found the presence of independent retailers helps communities retain their residents, especially those with college degrees. 5 | Community-scaled businesses reduce pollution and improve environmental sustainability. Several studies have found that people who live near small stores walk more for errands and, when they do drive, their trips are shorter. That’s not all: small retailers also influence how likely people are to take public transit. A study of 3,200 households in King County, Wash. (the Seattle area), for example, found that residents of neighborhoods with the most local businesses logged 26 percent fewer automobile miles than people living in areas with few neighborhood stores, and they were significantly more likely to take public transit to work. Click to download a two-page PDF version of this “Why Care” resource.